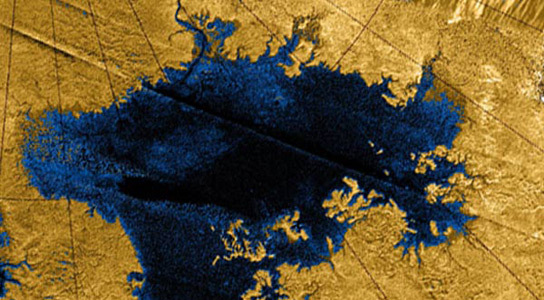 Astronomers have been researching Saturn’s moon Titan for roughly 30 years, discovering that the moon experiences seasonal changes that affect it more than previously thought. The researchers presented their findings during the European Planetary Science Congress of 2012 in Madrid last Friday. Athena Coustenis, from the Paris-Meudon Observatory in France, analyzed the data. Just like Earth, the seasons on Titan change. There are differences in atmospheric temperatures, chemical composition and circulation patterns, especially around the poles. Hydrocarbon lakes form around the north polar region during the winter due to colder temperatures and condensation. 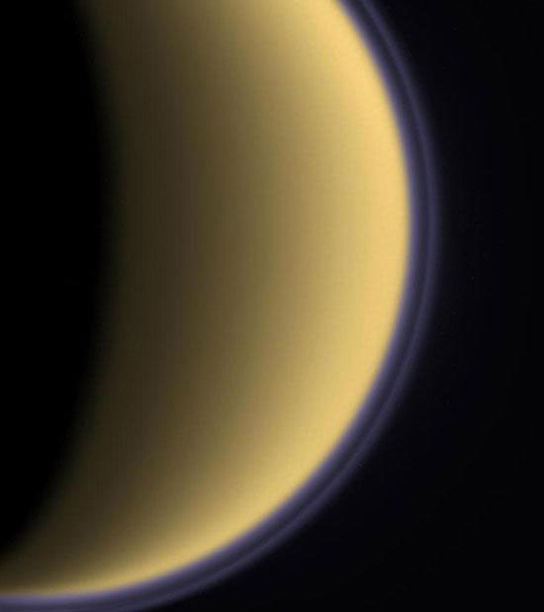 A haze layer surrounds Titan at the northern pole and it is significantly reduced during the equinox because of atmospheric circulation patterns. These rapid changes were unexpected, especially in the deeper layers of the atmosphere. Solar radiation is the main cause of these cycles and is the dominant energy source for Titan’s atmosphere. It breaks up nitrogen and methane into more complex molecules, such as ethane, and acts as the driving force for chemical changes. Titan has an inclination of about 27 degrees, which is similar to Earth’s, meaning that sunlight reaches different areas with varying intensity due to the tilt. Titan is 10.69 AU away from Earth. These conclusions are based on the analyzed data from several different missions, including Voyager 1 (1980), the Infrared Space Observatory (1997), and the Cassini spacecraft (2004 onwards), and complemented by ground-based observations. Each season on Titan spans about 7.5 years and it takes 29.5 years for Saturn to orbit Sol, so data has now been gathered for an entire Titan year. In terms of climate, meteorology and astrobiology, the conditions on Titan provide scientists with a great opportunity to study conditions similar to our own planet, while at the same time remaining a paradise for exploring new geological, atmospheric and internal processes. 1 Comment on "Titan Experiences Seasonal Changes"
How nice it would be for boozers to see lakes of methyl and ethyl alcohol and raining on them on seasons like earth? Titan not only receives solar radiation that drives the seasons on this exotic satelite of Saturn but also it will give an exotic view of two suns (for Titans) , one being distant cool Sun and other one being nearby failed star Saturn. The radiation from Jupiter also should contribute to this driving force on clouds of hydrocarbons and make seasons on its tilted axis of 27 degrees. Any future search for living organisms should be only from Titan because of rich hydrocarbons in its atmosphere.Thank You.